November 17th was the day with the most driving, from Phobjika all the way back to Paro which is over 150 km. This was the only rainy day of our trip. At Wangdue, we took a detour north to Punakha. 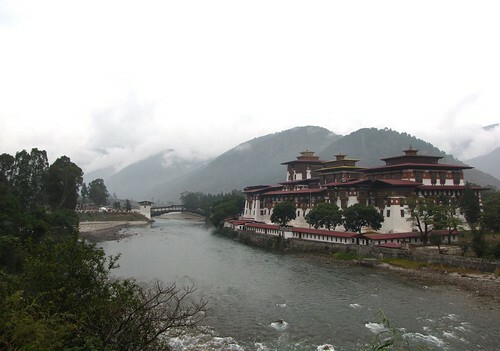 Punakha was the capital of Bhutan until 1955 - the dzong there is especially famous and this was our destination. A little way into Wangdue, we got tangled up in a huge traffic snarl. It was 10 am on a Tuesday, there were hundreds of people milling around and we hadn't seen this many vehicles anywhere else in the previous week. What the heck was going on here? 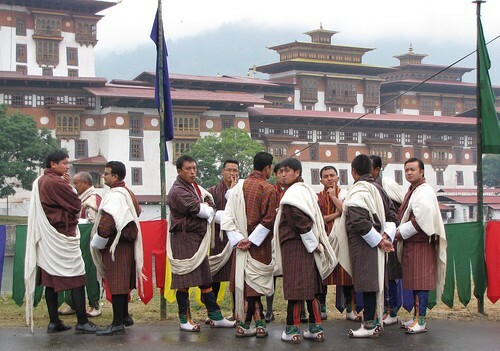 It turns out our trip to Punakha happened to coincide with the arrival of the Chief Abbot of Bhutan and the Central Monk Body. We were backed up on the road behind buses full of monks, the Abbot's Land Cruiser (which we had seen already in Thimphu) and two modified, ornamented pick-up trucks carrying sacred relics. 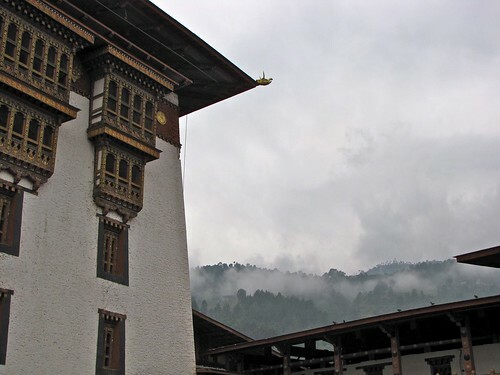 Everything I had read about Bhutan mentioned that the monastic body has moved from Thimphu to the warmer climes of Punakha every winter since the 17th century. However, I didn't expect to be caught up in an actual moving day procession. The whole way along the road, people were waiting to greet the Abbot and to receive a blessing from him. This was why the traffic was moving so slowly! Everyone was dressed up in their best outfits. Heaps of damp juniper branches were being burned to make offerings of smokey incense (I loved the scent). Eventually, once we had crept downhill into Punakha itself, our driver pulled off onto a detour. 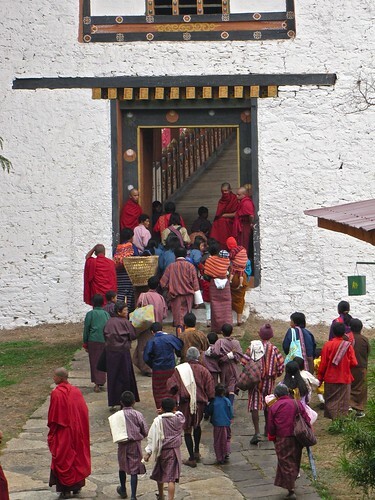 We took the back way to the dzong, bypassing the procession. 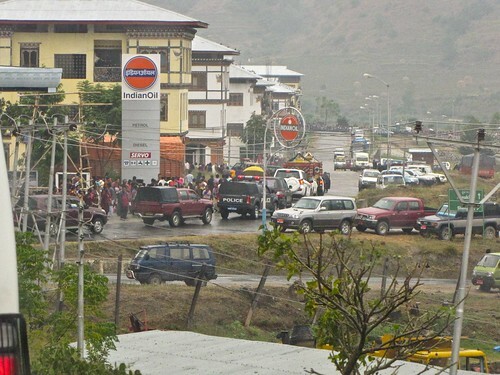 We zoomed past a temple where a row of monks in yellow fringed headgear like I'd seen in 'Tintin in Tibet' were standing on the roof, crashing cymbals and blowing giant horns. 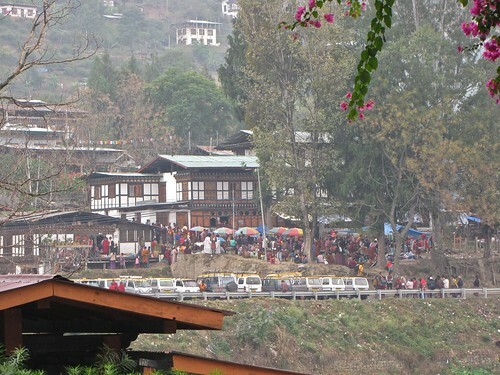 From the dzong, we could see the crowd of people across the river patiently waiting for the Abbot. 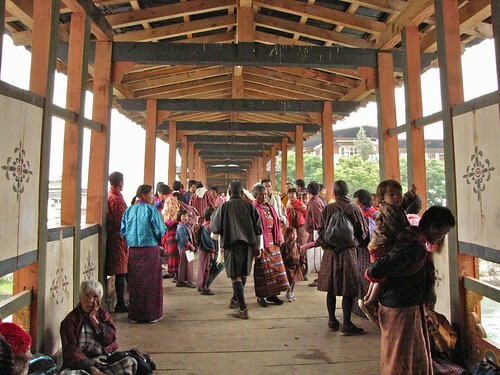 We didn't have much time to visit: I never figured out whether the problem was that the whole dzong would be so crowded that we couldn't move or if they would actually bar entry to tourists once the Abbot was there. Either way, we had to look around quickly. I tried to take some photos of the brightly dressed local people but I ended up having to sprint after my group so I wouldn't get separated. 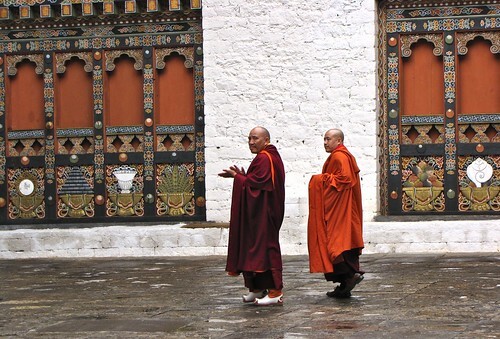 I wasn't the only one in a rush: monks in red were dashing in every direction, too, tending to last-minute tasks. This dzong is apparently the most richly decorated one, and the statuary in the inner hall was stunning. No photography allowed there. 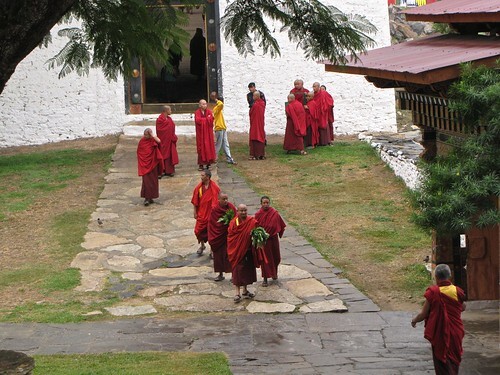 We made it in and out before the Abbot himself had completed the procession to the dzong. I was admiring these gentlemen in their embroidered boots and snapped a picture from the window as we drove by slowly. From the looks on their faces, they may not have appreciated me aiming my zoom lens in their direction... I'm sorry, but the photo was altogether irresistible. PS On his 'National Happiness' blog, Aby Tharakan wrote about the beginning of the procession.